What is knitting on the bias anyways? When I first tried to teach myself knitting from a library book, I couldn't even knit and purl in the same row. I would look forlornly at all the brilliant fair isle hats, cabled sweaters, and intricate beadwork thinking that I would never amount to anything. Fortunately, I stuck with it. To build the foundation for any type of knitting project, using any technique, for any yarn, all you have to learn is to knit and purl. From there, you're on your way to learning a million new things that are all just one easy step farther than you were yesterday. Knitting on the bias is simply knitting on the diagonal. The technique itself if very simple and relies only on decreases along one side of your pattern and increases on the other. 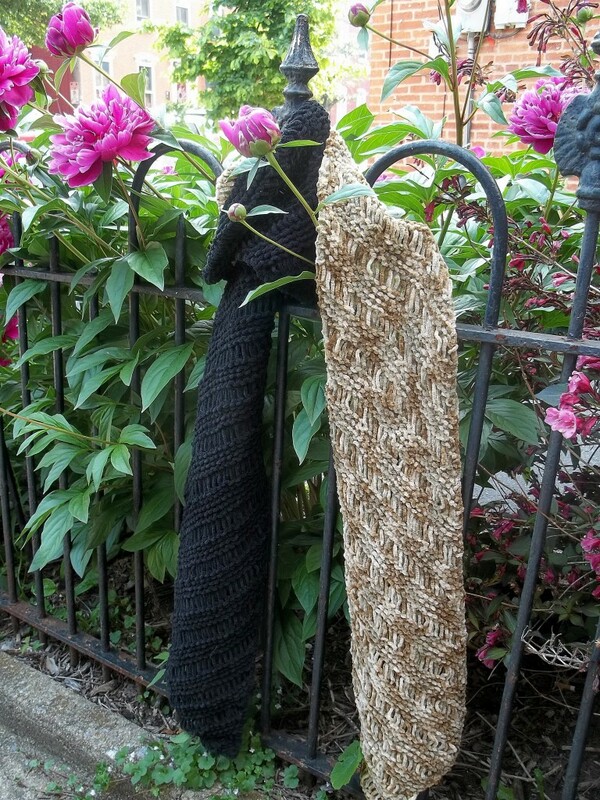 It is one of my favorite ways to show off variegated yarn without giant blocks of horizontal color. It's also a great way to make anything you make look fancy without needing any special skills or extra work. I hope you enjoy this lens. If you have your own techniques or think I should add something, be sure to tell me in the comments. Also, please check out my Etsy Shop ZyloHandmade for stylish knit and sewn accessories if you don't have time to make your own! How to use increases and decreases to bias knit. Bias knitting is nothing more than working your increases and decreases to their fullest advantage. 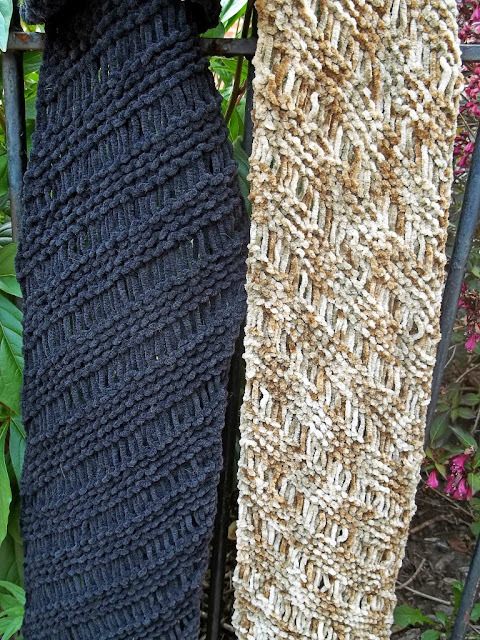 You can use your favorite increase and decrease stitches to achieve the effect you want, but for simplicity I will demonstrate using Kfb (knit in the front and back) and K2tog (knit two together). This will create a sharply slanted piece because you are increasing and decreasing on all rows. Row 1 (RS): K2tog, k to end. Row 2 (WS): Kfb, k to end. This will create a left slant that is not as sharp. The more often you increase and decrease, the more dramatic the bias will be. However, don't be afraid to experiment with a softer diagonal. Play with it to see how much you want for the pattern you are creating. Row 1 (RS): Cast on 1 stitch. Kfb. Repeat row 3 until the piece is as tall as you want. Then decrease using the following method. Repeat this row until you decrease your last stitch and bind off. You can use these techniques in a number of ways to create sharp slants, gentle curves, zig zags, and diamond patterns. Go wild. Short rows are a hot little number that not only give you another option of how to knit on the bias, but they can also be used to create interesting color patterns for variegated yarn and for shaping to create the perfect fit. They also make a great addition to your knitting repertoire because they make make anything look fancy with virtually no skill needed! The basic idea of a short row is to "interrupt" a row of knitting by turning before you finish and start creating an additional row. If you add multiple rows at even intervals, you will create a wedge shape. You can also start them at uneven intervals to create curves, patterns, or any other tailoring you want. When working with short rows, you will see a big debate on people who "wrap and turn" and those who don't. The idea is that once you turn your work, you can wrap your working yarn around the last stitch so turning doesn't create a hole. It's up to you whether you decide to wrap or not depending on the look you like and the garment you are creating. The instructions below do not include the wraps in parenthesis so you can try both and decide what you like. Cast on 20 stitches and knit a few rows in stockinette, ending on a purled row. Turn to the right side with knit stitches facing. Row 1: Knit 10 stitches. This will leave half of your stitches unknit. Don't panic. Row 2: (Wrap and) Turn your knitting so the purl side is facing you. There are 10 stitches on both needles. Purl 10 stitches. Row 3: Knit 9 stitches. (Wrap and) Turn. Row 4: Purl 9 stitches. Row 5: Knit 8 stitches. (Wrap and) Turn. Row 6: Purl 8 stitches. Continue in this way until you have worked all short rows down to one stitch and turn work so the right side is face. Now knit across all 20 stitches. You have just created a short row wedge shape on the right half of your work. Adjust the size of your short rows to your project. Let's use the same example above. If you are knitting in stockinette with knit side facing, knit your first ten stitches. Now bring your yarn forward as if to purl. Slip the next stitch knitwise and bring your yarn to the back as if to knit again. Now turn your work and slip this unknit stitch back to your right needle. This is wrapping your yarn to prevent gaps in the work. It is commonly abbreviated as w&t, w+t, or wt. 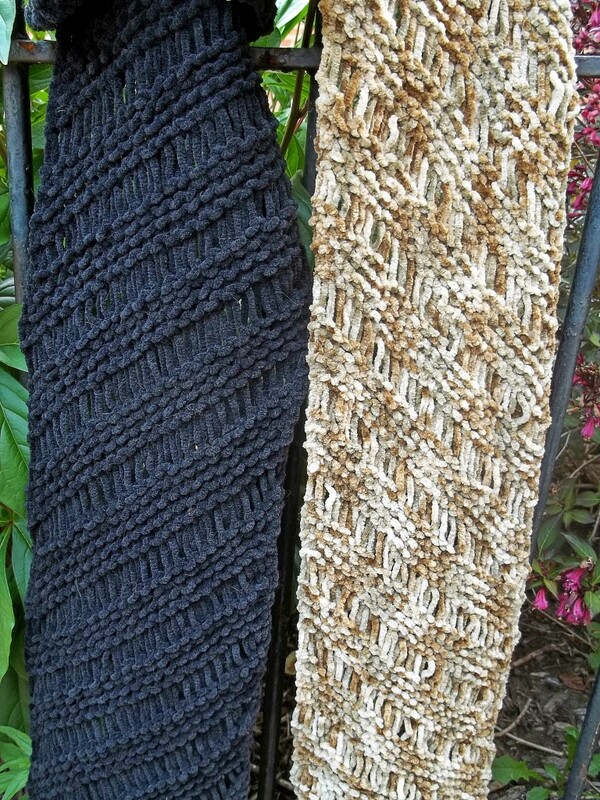 For a great visual example, follow this link in the next module to The Purl Bee where they give you a great visual example of the wrap and turn tutorial above. Method 3 - Entrelac: Using short rows to "weave"
Entrelac is a bias knitting technique that allows you to create a woven look for your piece by knitting one block at a time. Don't be fooled by the intricate fabric, entrelac is actually easy one you get the hang of it. You simply start by creating a few triangles. By working short rows back and forth to create small slanted blocks, you can pick up stitches on the sides to start another block slanting in the opposite direction. Here is an example of a basic stockinette entrelac pattern repeat. Knit 8. Do not turn. The first triangle is complete. For this example, you will have 3 triangles (24 stitches with 8 stitch pattern repeats). You have just created the base for your entrelac knitting. To knit the entrelac squares. Turn work, knit 3 stitches. Pfb, purl 1, p2tog, turn, knit 4, turn. Pfb, purl 2, p2tog, turn, knit 5, turn. Pfb, purl 3, p2tog, turn, knit 6, turn. Pfb, purl 4, p2tog, turn, knit 7, turn. Pfb, purl 5, p2tog. Your side triangle is complete, but do not turn. With purl-side facing, use right-hand needle to pick up and purl 8 stitches along the side of the base triangle. Turn work, knit 7 stitches, slip the last stitch as if to purl. Turn work, purl 7 stitches, p2tog. Repeat last two rows, slipping the last stitch on the knit side and purling 2 together each purl-side. To finish the square, knit 7 stitches, slip the last stitch again. Turn work, purl 7 and purl 2 together. With purl-side facing, pick up and purl 8 stitches from the base triangle.